Frog and the team battling Magus. 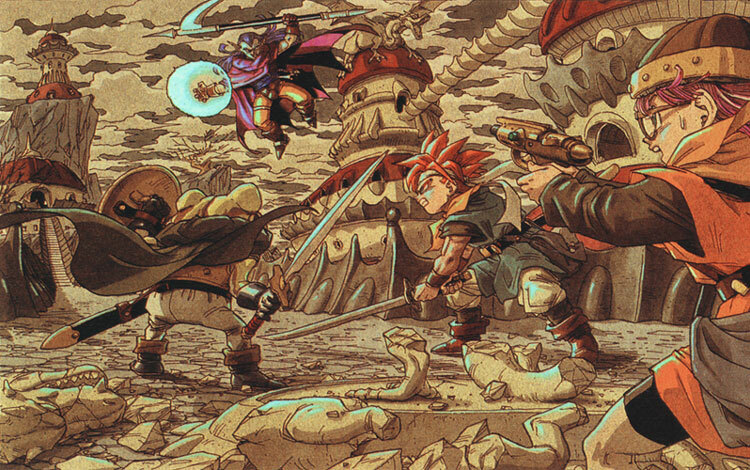 Crono and the gang arrive at the cave leading to Magus’s fortress, but find but the entrance sealed. Seemingly facing failure before they even started, Frog approaches the wall and begins to reminisce again. We see scenes of Cyrus and Glenn growing up. Glenn was timid as a child, and was often picked on by other children. Cyrus would come to Glenn’s aid, but would tell him that he needs to learn to defend himself. Years later, Cyrus tells his friend that he plans on joining the army, and that Glenn should join, as well. Glenn declines, however. Despite being even better with a sword than Cyrus, Glenn says he doesn’t think he’d be able to go through with it if he had to hurt someone. We then revisit the scene in the Denadoro Mountains where Magus casts his spell on Glenn. In the aftermath of the incident, we see Frog now lying in a stream at the bottom of the mountain as the Hero Medal comes tumbling down, and comes to rest next to his battered body. It now becomes apparent (if it wasn’t blatantly obvious already) that Glenn and Frog are one and the same. As the flashback ends, Frog turns around and tells Crono to give him the Masamune. Looking at it briefly, Frog’s doubts and fears seem to melt away instantly, finally acknowledging his past as Glenn, as well as his responsibility to carry on Cyrus’s legacy, and the protection of the kingdom. Taking the sword in hand, a massive burst of energy emanates from the blade, and Frog leaps towards the wall, splitting it asunder in a single slash. With the way now open, the team makes their way to Magus’s fortress. As they fight through the monsters at the castle, the team meets Magus’s lieutenants, Ozzie, Slash and Flea. They all seem to know Frog in some way, and taunt him about his appearance, as well as his weakness in the past. However, with his newfound inner strength, Frog brushes off these insults, and even shoots back jabs that end up infuriating his adversaries more. Eventually, the team reaches Magus’s inner sanctum, and do battle with the sorcerer himself. With the reforged Masamune in hand, and his friends at his side, Frog is finally able to defeat Magus and avenge Cyrus’s death. Unfortunately, the sudden appearance of Lavos cuts the battle short, and all of the combatants are thrown into a giant time vortex before the final blow can be delivered. Even so, Frog can rest easy knowing that the kingdom is now safe from Magus’s grip. However, there is still one person that he still feels a degree of guilt towards: Cyrus himself. Later in the game, there is a sidequest that has the team investigate rumors that the ghost of Cyrus is haunting an old castle. Upon entering the castle, the team is indeed attacked by an angry apparition in knight’s armor. The team has no way of harming the spirit, though Frog is able to calm it down by calling out Cyrus’s name. This is not enough to put the spirit to rest, however. Traveling back to the Middle Ages, the team visits the castle again, and eventually finds Cyrus’s final resting place deep inside. 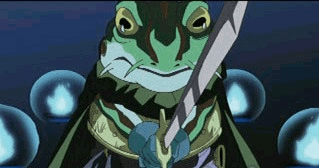 As Frog approaches the grave and brandishes the Masamune, Cyrus appears. Despite everything that Frog has accomplished on his journeys with Crono, he still feels a lot of shame and guilt about Cyrus death. Initially, Cyrus seems to confirm Frog’s doubts. He tells Frog that, in his last moments, he felt great regret for all the people he was leaving behind – the kingdom, Queen Leene and Glenn himself. But he then goes on to say that, seeing how far Frog has come, he now knows he can rest knowing that the kingdom will be safe. With that, Cyrus is finally able to find peace. Just then, the spirits residing in the Masamune come out, and tell Frog that they can finally let loose, and the sword will be able to reach its full potential. Finally having the strength to both come to grips with his past, as well as being able to let go of his regrets have freed Frog and the Masamune to reach their full potential, making both the frog-man and his sword forces to be reckoned with. So, what does this all mean? 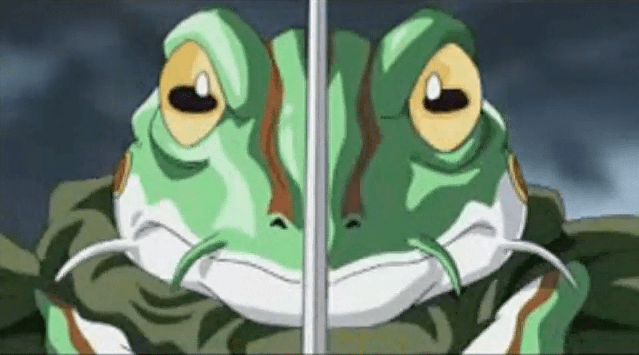 In the end, what did the Hero Medal and the Masamune have to do with Frog’s success. Well, in a way, nothing. It was shown multiple times in the game that the items themselves did nothing to help the owners. Tata was in possession of the Hero Medal, but it didn’t do anything to help him defeat the monsters guarding the Masamune. Cyrus wielded both the medal and the sword against Magus, but he was still defeated with little effort. The items themselves did not give Frog strength, but having them both certainly did give him the confidence to finally face his demons. The spirits of the sword themselves even said that it’s how one uses the Masamune that matters, not who owns it. Frog had the strength he needed all along, it just wasn’t until Crono and the team went to the extra lengths (and millennia) to bring the items back to him that he finally realized it. Seeing Frog start out as a chivalrous, yet conflicted mercenary, and eventually become a strong, clear-headed knight is one of my favorite developments in Chrono Trigger. While most of the main characters in the game go through difficult transformations of their own, Frog’s is by far the most painful, and seeing him overcome his past, and come out the other side stronger and better for it is extremely satisfying. Without the help of Crono and his friends, Frog might never have recovered from his past traumas. With their assistance, Frog was finally be able to do right by Cyrus, and take on the mantle as the kingdom’s protector. After all is said and done, Frog’s personal storyline is one of the reasons I think he’s one of the best characters of the game, of the SNES era and, simply, of all time.